Extruded Plastic Channels | C, H, & J Shaped Channels - Intek Plastics, Inc.
From apples to appliances, batteries to bubbly, cosmetics to cameras and beyond, Intek supports the display companies that create these retail environments and experiences. And smart retailers fully appreciate how excellent POP and POS displays can increase the average sale and improve the overall customer experience. In fact, they’re critical for moving merchandise in a variety of retail applications. C Channels easily attach to shelving, fixtures and displays to create changeable custom signing. When viewed from the side, it resembles the letter “C.” These can be designed to meet your specific needs, including pre-assembled with a foam tape for easy attachment. 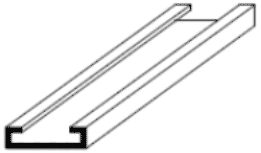 H Channels are used as a joining strip to attach other extrusions or sign inserts to create custom signage. H channels can be used to separate, connect or mate two parts together. H Channels can also be used in conjunction with J channels to mount signs. Intek can create the right combination of H and J Channels to meet your specific needs. J Channels present a “finished” edge in combination with other extruded elements to create custom POP signage. J Channels have many uses including holding displays, used as edging, and creating custom sized channels for repeat use. They can also be used in conjunction with H-Channels to create multiple signs.